The next stop for the BMW Motorrad GoldBet SBK Team and BMW factory riders Marco Melandri (ITA) and Chaz Davies (GBR) is Silverstone, Great Britain. 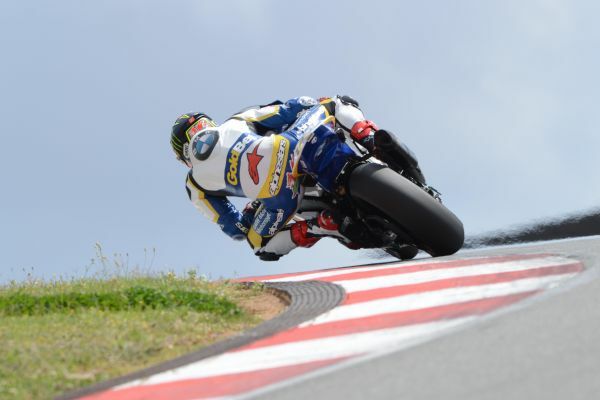 The famous circuit will host the ninth round of the 2013 FIM Superbike World Championship this weekend (2nd to 4th August.) For Chaz, it is the second home round of the season after the Donington Park round at the end of May. After riding his BMW S 1000 RR to victory at the last round in Russia, Marco improved to third in the Riders’ classification with 207 points, 32 points adrift of the lead. Chaz, who finished second in Russia, is fifth with 174 points. In the Manufacturers’ classification, BMW has collected 262 points so far and is currently third, 38 points from the lead. After BMW Motorrad Motorsport announced last week that it will withdraw from the FIM Superbike World Championship at the end of the 2013 season, the squad remains focused on claiming more strong results in the remaining rounds of the year. MW is currently leading in both the rider and manufacturer standings. Sylvain, who has won three of the five races contested this year with the new BMW HP4, tops the Riders’ classification with an advantage of twelve points. In the Manufacturers’ classification, BMW is in front too, having a gap of five points to its closest rival. “Silverstone is a great and fast track and at the same time it is also very difficult due to its changes of pace and bumpy surface but I still really like it. I hope that the weather - which is always unpredictable in the UK - will be good this time. “Of course I feel sorry about BMW Motorrad’s decision, but this year we still have a long season ahead of us with many rounds in which we want to continue to be successful. So we keep being focused and working hard. The next round is my home race at Silverstone. Even though I would not rank it as one of my most favourite circuits, I quite enjoy riding there. It is different challenges because it is quite fast and open. In addition, you find different corners on this circuit than you find anywhere else. It is completely flat but it is very difficult to set the bike up, especially a Superbike, because it is bumpy. “We have noted and accepted the strategic decision that the company has taken and I want to thank BMW Motorrad for the level of competitiveness we have reached and for the great performance in the season so far. Our riders are doing very well and they will go on this way until the end of the season, keeping their focus on the present because the results we are achieving now are the base on which we will now build our future. All the guys from the team are doing the same and will continue to do their best and, for sure, the decision will not have any influence on the rest of the season because they are real professionals. “After the very emotional race weekend we experienced in Moscow, the team also had to learn and understand the strategic decision taken by BMW for the future of the SBK project. The last few days were not the easiest ones for all of us but I’m sure that all the guys will keep working as usual. They are professional and very much motivated to achieve, race by race, the results that all of us deserve. In Moscow we’ve seen that both riders were quite fast in both dry and wet conditions. This will be very important for the next race in Silverstone where the weather can change quickly, as we saw last year. The British track is one of the longest circuits of the calendar with very fast corners where the riders can use a smooth and flowing riding style, it’s a technical circuit where the side grip is quite important especially in the long turns. Silverstone offers a combination of high-speed straights, with high localized pressures in the centre of the front tyre (in particular at ‘Stowe’), interspersed with very technical and fast turns, which generate intense loads on the side (like at ‘Becketts’) and high levels of spinning. These features, combined with the presence of multiple dips on the asphalt, the medium-low mechanical grip and the abrasive asphalt of the circuit, play a key role in the tyre choice. The biggest question mark will be certainly made up by the weather that, as usual in England, is highly variable and may hide some surprises during summer. The riders in the Superbike class will have two slick solutions for the front and three for the rear, joined as always by the rear qualifiers, the intermediate solutions and the wet tyres. On the front, Pirelli brings the standard SC1 solution (R426) in a soft compound - ideal for low external temperatures and/or medium harsh tracks, as well as the standard SC2 (R982), excellent for high external temperatures because it guarantees a solid tread strip. Both solutions have been already brought to all rounds raced this year. The solutions for the rear include the new development solution R1431 in SC1 compound which debuted at Imola and which has been used by all riders in Russia. It’s a tyre designed with the goal of providing higher tear resistance but equal grip compared to the standard SC1. To better evaluate the performance of this new solution at Silverstone there will be also the SC1 of range (R828) already present in the first three rounds and used by all riders at Motorland Aragón. The last slick option for the rear is the R1301, an SC2 development tyre. It should be ideal when temperatures are expected to be particularly low because it’s more protected from the cold tearing. The town of Silverstone in the British county of Northamptonshire may only have about 2,000 inhabitants, yet it plays an integral role in the history of motorsport. After the Second World War, a racetrack was built on the site of a former military air base. That track is now one of the most iconic and famous in the world. Silverstone is the “Home of British Motor Racing” and many racing teams and suppliers have based their operations in the region. The first Formula One race ever was held here in 1950, while corners such as “Maggotts”“, “Becketts”, “Copse” and “Stowe” are universally recognised. In 2010, extensive modifications and renovations heralded a new era for the “Silverstone Circuit”. A new section, the stadium-style “Silverstone Arena”, was built during this phase. One year later, the imposing new pit lane complex – the “Silverstone Wing” – was opened between the “Club” and “Abbey” corners. The Superbike World Championship staged races in Silverstone between 2002 and 2007 and has returned to the iconic circuit in the heart of England each year since 2010. This year, the Superbike World Championship will pitch its tents at the old, National Paddock. As a consequence, the course of a lap will change. The start-finish straight will return to the “National Pit Straight” between the “Woodcote” and “Copse” corners. The “Silverstone Circuit” is one of the longest, most flowing circuits on the Superbike World Championship calendar. The flat track throws up a technically demanding combination of many fast corners, several long straights, and stop-and-go sections. Due to this layout, the engine performance of the BMW S 1000 RR is key. However, it is also important to have a sensitive throttle response. Among the tricky aspects of the circuit are the many bumps that lurk in certain places. Then there is always the unpredictable British weather: glorious sunshine can be replaced by rain within a matter of minutes, and vice versa. Race 1: Loris Baz, Kawasaki Racing Team, 40.46,128 min. Race 2 (8 laps): Sylvain Guintoli, Pata Racing Team, 19.42,051 min. Ayrton Badovini, BMW Motorrad Italia GoldBet, 2.06,764 min.